Saturday Auction encourages you to review the privacy statements of websites you choose to link to from Saturday Auction so that you can understand how those websites collect, use and share your information. Saturday Auction is not responsible for the privacy statements or other content on websites outside of the Saturday Auction family of websites. Saturday Auction collects personal data, as a result of its various activities. These activities are listed below, together with an explanation of the data collected and the lawful basis for processing. Saturday Auction collects personal information from you when you use our products or services, including name, email address, postal address, telephone number and job title. To send you personalised communications which you have requested or may be of interest to you. These may include information about auction events, publications, webinars, events, surveys, product and service developments. The lawful basis for processing your personal information for this purpose will be “Legitimate Interest”. Saturday Auction uses automated decision making and profiling to personalise and ensure the communications are relevant to you, with no significant effect on you or your rights. The lawful basis for processing your personal information for this purpose will be “Legitimate Interest”. Saturday Auction collects personal information from you when you contact us about our products or services or subscribe to our newsletters, including name, email address, postal address, telephone number and job title. To send you personalised communications which you have requested or may be of interest to you. These may include information about auction events, publications, webinars, surveys, product and service developments. The lawful basis for processing your personal information for this purpose will be “Legitimate Interest”. 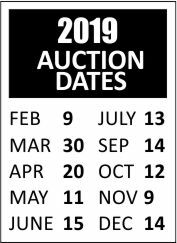 Saturday Auction collects personal information from you when you register at or register to attend an auction event hosted by or participated at by Saturday Auction. The personal information collected will include your name, email address, telephone number and in some cases your job title. To carry out obligations arising from being a registered attendee of our event or other events. The lawful basis for processing your personal information for this purpose will be “Legitimate Interest”. To send you personalised communications which you have requested or may be of interest to you. These may include information about auction events, our services, publications, webinars, surveys, product and service developments. The lawful basis for processing your personal information for this purpose will be “Legitimate Interest”. Saturday Auction collects personal information from you when you take part in telephone research conducted by Saturday Auction. The personal information collected will include your name, email address, telephone number, postal address, company name and in some cases your job title. To send you personalised communications which you have requested or may be of interest to you. These may include information about auction events, services, publications, webinars, surveys, product and service developments. The lawful basis for processing your personal information for this purpose will be “Legitimate Interest”. Saturday Auction collects personal information from you when you supply products or services to Saturday Auction, including name, email address, postal address, telephone number and job title. Saturday Auction collects personal information from you when you apply to work for Saturday Auction, including name, email address, postal address, telephone number, employment history, education history and details of referees. To complete the interview process, we will use your personal information to communicate with you, complete background checks where permitted by law and manage your application through the interview selection process. The lawful basis for processing your personal information for this purpose will be “Contractual Need”. Saturday Auction collects personal information from you when you work for Saturday Auction, including name, email address, postal address, telephone number, date of birth, employee identification number, bank details, national insurance number and emergency contact details. In case of emergencies we will utilise your emergency contact details. The lawful basis for processing your personal information for this purpose will be in the employees “Vital Interests”. Saturday Auction obtains personal data from 3rd party sources. These sources are listed below, together with an explanation of the data collected and the lawful basis for processing. We use the website traffic and visitor information to improve our understanding of the use of the Saturday Auction website and in order to determine what Saturday Auction services are the most popular. The lawful basis for processing your personal information for this purpose will be “Legitimate Interest”. Saturday Auction obtain personal information from 3rd parties, including name, email address, postal address, telephone number and job title. To combine with information we have captured directly from you to send you personalised communications which may be of interest to you. These may include information about auction events, services, publications, webinars, surveys, product and service developments. The lawful basis for processing your personal information for this purpose will be “Legitimate Interest”. To provide this information to others for direct marketing of their product or services by inclusion in Saturday Auction’s commercial dataset. The lawful basis for processing your personal information for this purpose will be “Legitimate Interest”. All individual’s obtained from 3rd parties, for this purpose, will have been provided the opportunity to object to their use of personal information by 3rd parties, by the data provider. Personal information obtained from 3rd parties for the Saturday Auction Commercial dataset will be recompiled on a regular basis to ensure the data is fresh and relevant. We share information, including personal information, with trusted third-party service providers, that we use to provide hosting for and maintenance of our website, event management, customer relationship management, payment processing, support, accounts, analytics and other services for us. We do not permit our third-party service providers to use the personal information that we share with them for their marketing purposes or for any other purpose than in connection with the services they provide to us. Saturday Auction is committed to protecting the security of your personal information. We will use a variety of security technologies and procedures to protect your personal information from unauthorised access, use or disclosure. Although we will do our best to protect your personal information, we cannot guarantee the security of your data transmitted to our site; any transmission is at your own risk. Once we have received your information, we will use strict procedures and security features to try to prevent unauthorised access. Saturday Auction secures the personal information you provide on computer servers in a controlled, secure environment, protected from unauthorised access, use or disclosure. Saturday Auction is committed to providing you with control on how your data is used and processed. You can review, edit or delete your personal information free of charge by contacting us directly at DataController@SaturdayAuction.co.uk, or by telephone 0345 257 3070.
you can object to receiving direct marketing communications from us and we will stop all communications free of charge. In addition, any direct marketing communications you receive from us will always include a clear, simple method to ‘opt-out’ of future communications. Saturday Auction use “cookies” to help personalise and enhance your online experience when visiting our website. (c) Copyright 2018 Saturday Auction. All rights reserved.